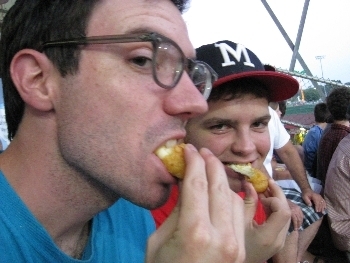 With both myself and the newly arrived Carson Cistulli now residing in Madison, Wisconsin, the only natural thing to do would be to catch the main baseball fare of the city. That means heading down to the Duck Pond at Warner Field and catching a Northwoods League game with the Madison Mallards. The Northwoods League is in the same vein as the Cape Cod League and many others in that it is a collegiate wood bat league. Outside of the fact that these players are amateurs, the Northwoods League models itself as a minor professional league, using the same rules and equipment. The league is in its 16th season and has graduated at least 48 MLB players and has seen 277 players drafted in the last two seasons alone. Notable alumni of the Mallards include Ian Kinsler and Ryan Spilborghs; others from around the league include Ben Zobrist, Andre Ethier, Max Scherzer, Curtis Granderson, and most recent graduate, newly debuted Cubs’ starter Thomas Diamond. Mallards starter Matt Morgan (Purdue) was torched for a few singles in the first inning by the opposing Eau Claire Express, allowing three runs in the first inning. Felix Cardenas (University of Texas-Permian Basin), starting for Eau Claire, got touched up for three runs in the first inning as well, thanks to three well-struck doubles from Mallards hitters. After another two Express runs scored in the second, thanks partially to SS Ty Forney’s (Yavapai) second single of the game, Morgan settled in, striking out 9 (unofficial) batters in only five innings of work, walking two. But the Express, led by Forney and a two hit performance from Nathan Orf (University of Illinois-Chicago) did manage six runs off of Morgan. Six would be just enough to hold off Madison, who despite a 3-5, 2 2B performance from Josh Parr (Illinois) and a 3-5, 2B performance from Carson Cistulli special Reed Gragnani (Virginia), couldn’t take home a win. With the score 6-5 in the bottom of the 9th, the Mallards put two on base, but #3 hitter Kyle Gaedele (Valparaiso) grounded into a double play (in a possible bunt situation! ), and the Mallards’ rally died along with their chances of winning the game. • Firstly, it’s impossible not to note the quality of the facility (Madison’s Warner Park) and the excellent crowd in attendance. I’ve mentioned in both these and other pages how underwhelming the experience frequently is at Portland’s PGE Park, a stadium that was drawing fewer than 4000 fans per game this season despite a capacity of around 19,000. By contrast, the announced attendance at Warner was something like 6,700 — this despite the fact that Jack and I, eyeballing the stadium, figured it couldn’t have a capacity of much more than 5,000. • In terms of performance, Mallards reliever and Santa Clara sophomore J.R. Graham displayed the best stuff of any pitcher. Throwing the 8th and 9th innings for the Mallards, Graham routinely hit 95 and 96 mph with his fastball — this while every other pitcher struggled to cross the 90 mph threshold. Graham complemented his fastpiece with an 85 mph slider that appears to be a decent, if not devastating, offering. Though he struck out two in this two innings of work, his strikeout totals for the summer (18 K in 26.0 IP) don’t appear to be in line with what I saw tonight. Nor were his numbers at Santa Clara off-the-charts awesome this year: 27.1 IP, 21 K, 10 BB). This is on a Santa Clara team that featured no fewer than four pitchers with K/9 above 9.00. • Among batters, Madison’s Kyle Gaedele, who just finished his sophomore year at Valparaiso, looks the part of a prospect. He offers an interesting power-speed skillset, entering the game second on the Mallards in homers (6), first in triples (5), and first in stolen bases (23 in 25 attempts) in 247 at-bats. Interestingly, his numbers in college this season were almost identical: 236 AB, 8 3B, 7 HR, 17/17 SB. His plate discipline numbers (23 BB and 40 K in Madison, 23 BB and 42 K at Valpo) are also shockingly similar. Interesting note: Gaedele is the great-nephew of Eddie Gaedel, the 3’7″ player who became the shortest player to bat in a major league game, taking a plate appearance for the St. Louis Browns while wearing the jersey number 1/8. • Finally, catcher Rafael Lopez had probably the hardest hit ball of the night — an opposite-field line-drive double almost all the way to the left-center wall. Though he doesn’t have a body you’d call “projectable” — he stands at 5’9″ — his numbers on the season are hard to ignore: 92 AB, .337/.436/.533, 14 BB, 11 K. This for a team with a collective line of .282/.369/.398. Lopez had a less impressive college season, slashing .278/.389/.397 for a talented Florida State team that slashed .300/.411/.496 as a team en route to an 18-12 record in the ACC. We hoped you liked reading Experiencing Northwoods League Baseball by Jack Moore! The best part of Mallards games is their INCREDIBLE beer selection. I wish MLB parks had choices half so good.